I feel as if I'm always trying to find my cell phone charger or even my cell phone in general. Zach and I have several chargers everywhere around the house but were always missing the chord or some sort of piece to it. Since starting to declutter and reorganize my house the last two weeks, I figured out a great solution to not only keeping my phone in one spot, but making the long cord look tidy and neat. When my cell phone is happy, I'm happy. Lily has a lot of lotions bottles that we end up throwing away but I held onto one for this idea. I used a Johnson's baby lotion bottle, a pair of scissors, a box cutter/ exacto knife ( not pictured ) and spray paint I picked up at my local Home Depot. The first thing I did was hold my iPhone6 phone up against the bottle to see how I high I wanted the front of the bottle to me. I then traced around the back but curved it upwards so there would be a resting place for my phone. Using scissors, I cut along the line of the lotion bottle. For me, this was easy because I had a good grip on the handle of my scissors but if you want to smooth the edges out you can either use a box cuter or sand down the edges once it's been cut. I traced the back of my plug in charger to get a good measurement of the square and also cut that out. Once the edges were all smooth, it was painting time! I've seen a few bloggers use various tools to design their holders. Some have used fabric, drawn on them with magic markers or spray painted them like myself. I loved the color of the spray paint I found at Home Depot and decided to take that route which was easy and ( pretty ) mess free. Since it was cold outside when I ( or Zach rather ) were spray painting, we had to spray paint a side, let it dry and then spray paint again for a few hours to get the right coat and make sure it was fully dry. The end result was exactly what I had envisioned. There you have it! 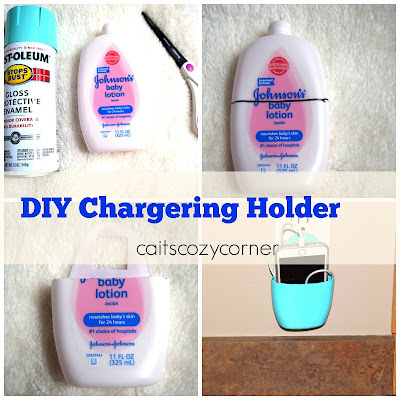 You've repurposed a lotion bottle into a sturdy cell phone holder for both your phone and cell phone cord. I understand a few people have been uneasy about it using it since the plastic is near an outlet, so use at your own risk if you're wanting to try this. How cool--genius! Pinning this for sure! This is a brilliant idea and so cute! Thank you for sharing! i've seen this on pinterest but have never seen anyone actually make it, so i'm glad to know it really works!! love it! i love the color you painted it, too.